Detectives investigating the murder of Northern Ireland police officer, Ronan Kerr, have made a second arrest after searches in County Tyrone and Cumbria. A 39-year-old man from the Omagh area of County Tyrone has been arrested under the Terrorism Act by the Police Service of Northern Ireland (PSNI). On Monday evening a 22-year-old man, also from Omagh, was detained by police in Milton Keynes, Buckinghamshire. 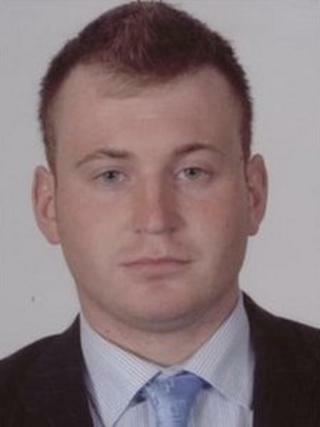 Constable Kerr, 25, died in a booby-trap car bomb in Omagh on 2 April 2011. Dissident republican paramilitaries have been blamed for killing the newly-recruited Catholic constable. A PSNI spokeswoman said the 39-year-old man has been taken to Antrim police station. He has not been arrested on suspicion of murder, but is being questioned about incidents related to the attack on Constable Kerr. The first arrest was made by officers from the North West Counter Terrorism Unit at the request of PSNI Serious Crime Branch detectives. The 22-year-old man remains in custody. Mr Kerr, who was also an active member of the GAA (Gaelic Athletic Association), was seen by many as a symbol of Northern Ireland's new police service. The officer joined the PSNI in May 2010. A republican splinter group, claiming it was made up of former members of the Provisional IRA, later admitted responsibility for his murder. Mr Kerr was the second police officer to have been murdered since the Royal Ulster Constabulary became the PSNI in 2001.